Somewhat warm breezes are beginning to blow and I’m in the mood to get dirt under my fingernails! 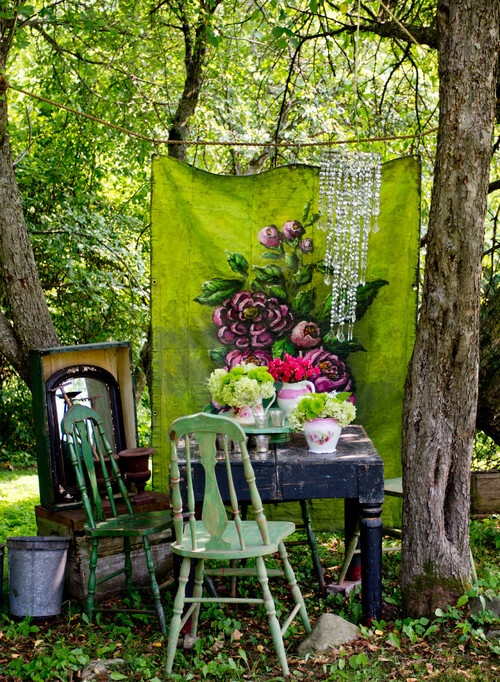 I stumbled across a country garden tour photographed by Rikki Snyder and it’s got me inspired. Stepping up to the front door of the historic Colonial home, you get a hint of what you’ll see throughout the gardens. 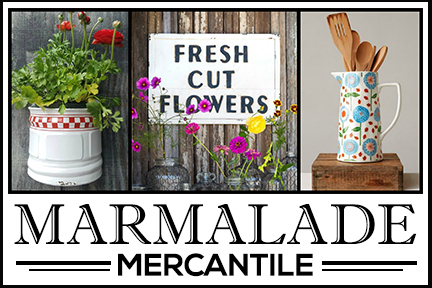 Second-hand treasures dot the property in really delightful ways. 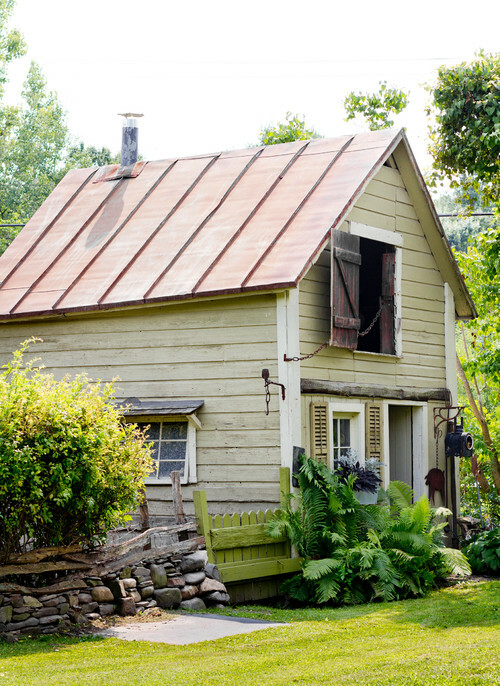 Charming outbuildings add architectural structure to the country landscape. 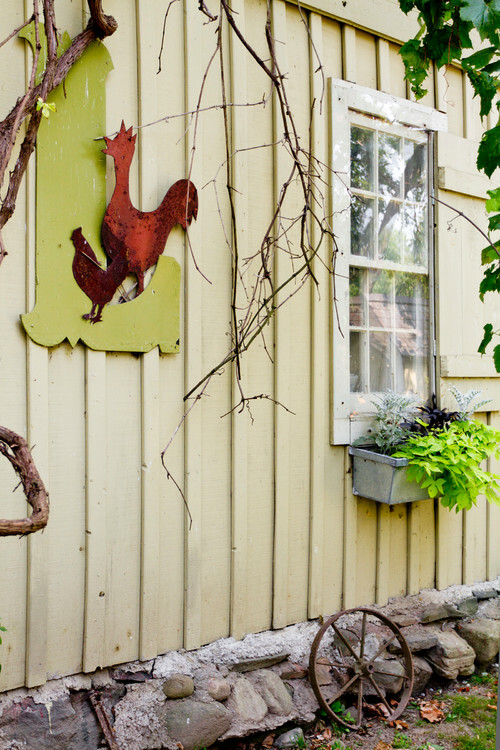 The shed has so many wonderful details like multi-paned windows, a hay window, and shutters and a flower box at another window. 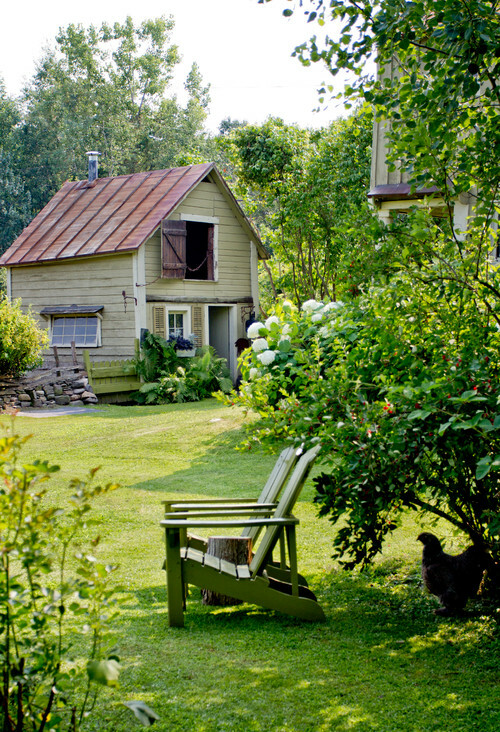 Adirondack chairs beckon you to join the chicken and enjoy the view. 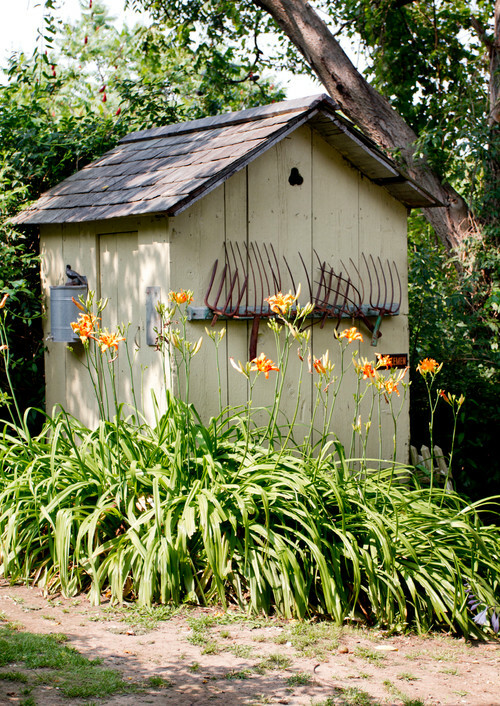 I’m not sure if this is an outhouse or another shed, but regardless, it’s pretty cute. Old metal rakes create quaint wall art. Winding vines make their appearance throughout the country garden. 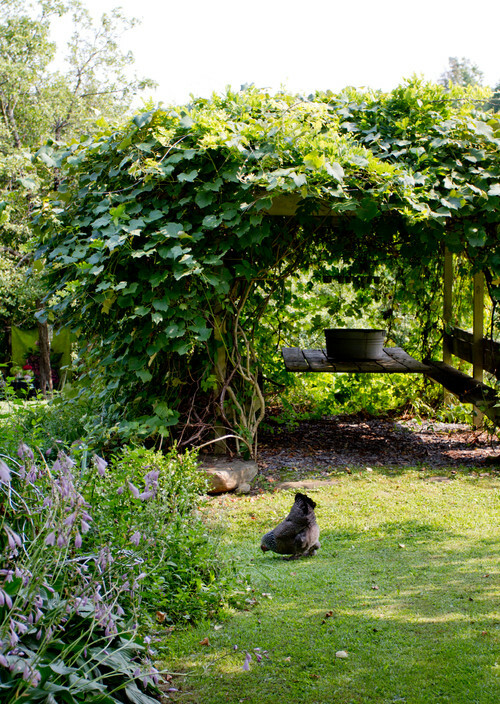 I’ve always loved how vines create canopies and cozy spots in the landscape. 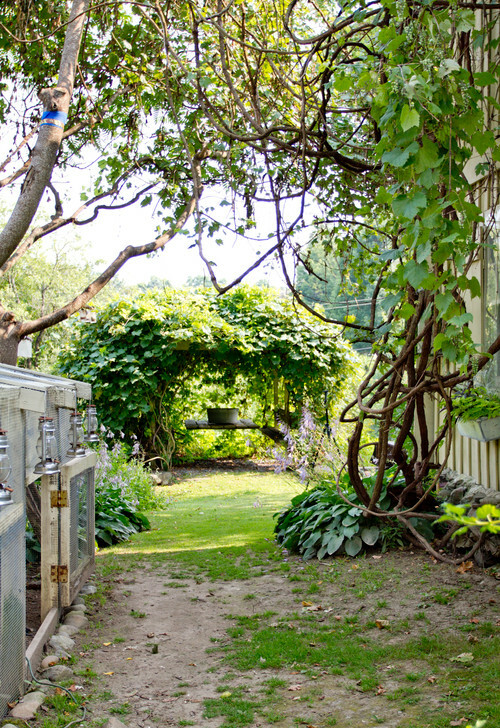 Chickens roaming here and there simply add to the appeal of this charming garden. 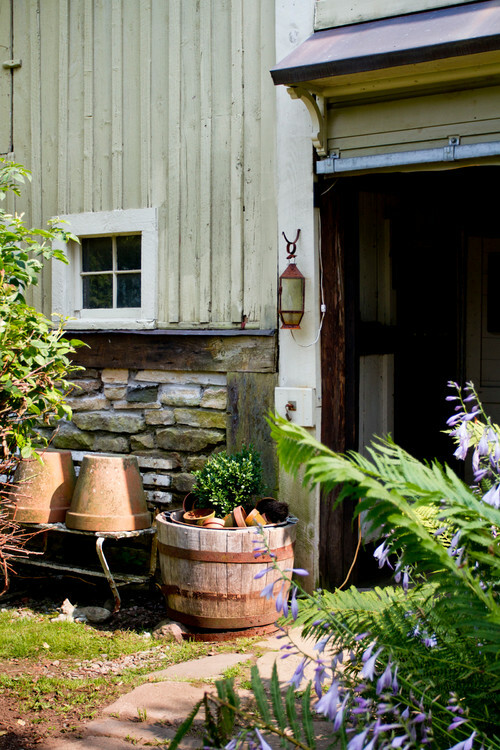 Outbuildings with stone foundations show their age. Lanterns light doorways and paths. Everywhere you turn in this garden your eye is delighted with a new discovery. 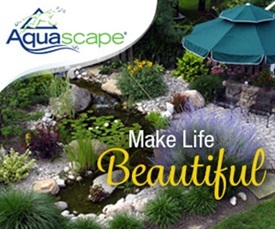 It just goes to show – a little ingenuity and creativity can turn any space in your yard to something truly special. Recently, we had someone do a landscape drawing for our backyard. I’m super excited about it and will share it with you very soon! 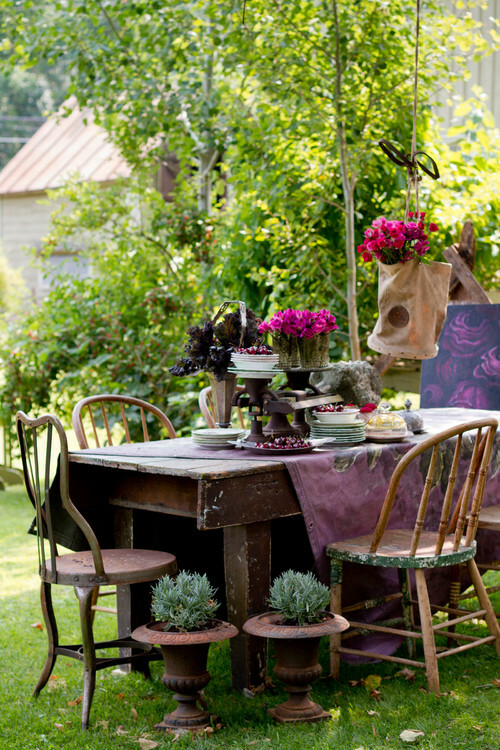 In the meantime, you can see more of this charming country garden at Houzz. Who or where do you find this person to draw your garden plan? What type of person does this? Please give a range of price for having this done. Hi Nan! Our backyard is going to include a pond so a guy from Aquascape (where I work) came out and drew up the plan for my backyard. I plan to have our local garden center draw a plan for the front and side yards. They come out to the house. If they’re designing the whole yard, they charge $300. If they’re just designing a front or backyard, it’s $150. They also design smaller areas for $50. You get to keep the drawing and can start adding the ideas in phases to make it more budget-friendly. Or they’ll come out and do it for you all at once. I love the flexibility they offer. 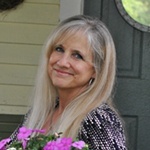 Check with a local nursery that offers design-build services. How excited you must be to get started on your outdoor plans. I know you have been waiting patiently. Thanks for sharing this gem. I’m thinking the winding vines are Wisteria. Imagine the beauty of that in bloom? Hi Cindy! How I would love to have massive wisteria vines to enjoy! Finally our daffodils and scilla are up. Virginia Bluebells are starting to emerge – they’re my favorite spring flower. Violas are a fave, too! 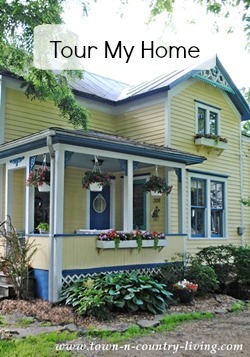 I love this country garden home. 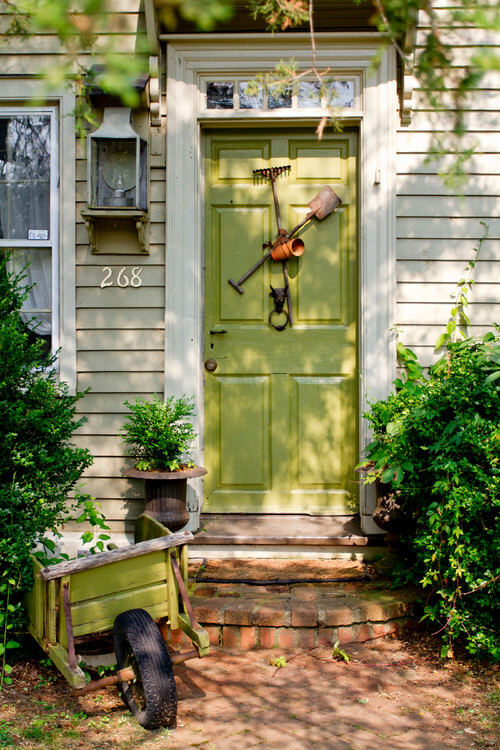 No worrying about perfect lawn, perfect paint, perfect decor. I could live there so easily – a truly no-judgement zone with its natural beauty the only thing you need. Sigh …. Pat, that’s a great way to look at this garden – a “no-judgement” zone. That makes it sound like the perfect paradise on earth! Country life is the very heart of nature. The old saying ‘Early to bed early to rise, makes a man healthy, wealthy and wise ‘ this could not be a truer statement. Why ? You learn to live by nature’s way. All weather conditions and etc. It’s truly the beauty of life. I would love to play in this yard, i’m not sure anything you had to do would be much of a chore, just fun. Thanks Jennifer.